After the disappointment that was The Mammoth Book of Body Horror, I was in the mood for something familiar. 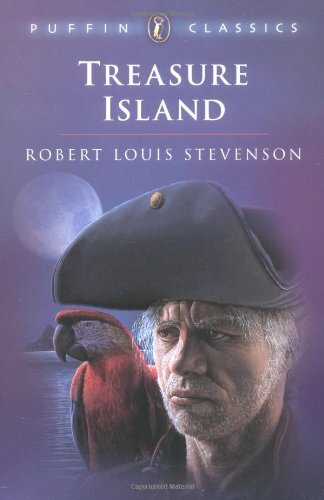 I hadn't read Treasure Island in years, and remembered really enjoying it when I was younger, so it seemed like the perfect book to revisit. Treasure Island follows a young boy named Jim Hawkins. Helping his parents run their inn, the Admiral Benbow, he meets a cantankerous old sailor who is rather keen on avoiding other seamen. When he dies after his old crewmates turn up to harass him, Jim gets his hands on the old man's sea-chest, with a treasure map inside. Joined by Doctor Livesey and Squire Trelawney, they embark on a journey to retrieve the treasure, gathered initially by the infamous Captain Flint. But all is not well, as their crew of honest hands has been infiltrated by former members of Flint's crew, most notably the one-legged Long John Silver. It might just be the innumerable film adaptations overriding my memories of the book, but I do not remember there being quite as much malaria in Treasure Island. I'd also managed to forget a whole chunk of the book in which Jim manages to steal back their ship, the Hispaniola, which is probably more worrying. Regardless, I still enjoyed it about as much as I did when I was a kid. There was a small part of my brain making things weird by thinking of my two favourite adaptations (the Muppet version and Disney's weird but somehow still coherent Victoriana Space Opera version), but it does definitely still stand up by itself. One thing that I will mention for those of you who haven't read Treasure Island, but have seen a bunch of the adaptations is that Hollywood has a weird obsession with trying to make Long John Silver into a kind of weird father-figure for Jim. There isn't really much of that in the actual book, with Silver being more or less a child-friendly depiction of a psychopath. Sure he switches sides towards the end, but not out of any genuine affection for Jim; considering that the alternative is dying on a malaria-ridden island with three former comrades who really aren't satisfied with the way that his grand voyage has panned out, it's a purely pragmatic decision. That's not a bad thing, it's just something that would stand out if you've only ever seen film versions before.